It could have been an omen of trouble ahead, but of course we were too confident at the time to notice. It was back in September on the day of the long-awaited NFL season opener, when the Saints were finally about to unleash their wrath after the excruciating off-season of Bounty Gate and Brees contract brinksmanship. The victim was to be the Redskins, with their rookie quarterback, and we even had our vaunted home field advantage. A blowout was widely predicted. So, who could care if throngs of Washington fans in burgundy and gold were seen spilling out of Johnny White’s onto Bourbon Street for an impressively large and spirited pre-game party? But now that the Saints season is all-but-cooked and Washington’s stock keeps rising, that Redskins rally keeps coming back to me. We are a multicultural city, after all, and some of those cultures follow football teams besides the Saints, the Tigers and the Green Wave. So we have bars catering to other teams, places where their fans can gather with like-minded company, whether they be card-carrying New Orleanians with exotic sports allegiances or out-of-towners in for a visit. The more common type is the neutral ground sports bar, of which we have a few more lately. 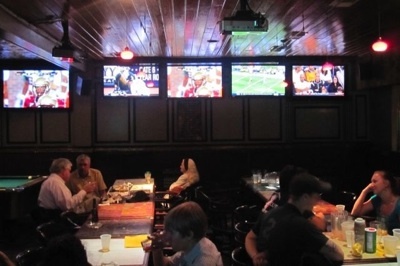 These are places where screens line the room showing different games, and fans from every corner of the NFL nation can be spotted in the crowd on any given Sunday. Manning’s and Walk-On’s (and the related, slightly racier Happy’s Irish Pub) are relatively new options in the mix, along with an even-newer outpost of the national Buffalo Wild Wings chain in Metairie. Cooter Brown’s Tavern & Oyster Bar is a homegrown version of the type, while down in the Quarter there’s Ryan’s Irish Pub (241 Decatur St., 504-523-3500) a smaller, cozier place that does the same job. But then there are those sports bars with a more overt partisan edge. Johnny White’s, as was made so evident, is a Redskins bar. Markey’s Bar in the Bywater is a haven for New England fans. And while the Milan Lounge (1312 Milan St., 504-895-1836) looks every bit like the classic Uptown watering hole, it also sports a lot of Chicago gear – mainly for the Cubs, but Bears fans should fit in here too. The Jimani in the French Quarter also has Chicago cred, though it falls more in the come-one, come-all sports bar category. On the college football front, local Alabama fans getting ready for the national championship game next month should remember the Rusty Nail, which became an unofficial party headquarters for Crimson Tide supporters during last year’s championship game. Notre Dame is on the other side of this year’s ultimate college match up, and while it’s likely any bar with the word “Irish” in its name will have certain sympathies going into this one, Finn McCool’s Irish Pub has been unsurprisingly virulent in its support of the Fighting Irish all season, with an ersatz leprechaun in attendance and fans raising the seven varieties of Hibernian hell for just about every first down. As the Saints season slogs into irrelevance, New Orleans football fans may yet wring some pleasure from the great games still to be played this year as the dreams of other teams march on. Of course, this brings up the dread question of whether New Orleans somewhere harbors a Falcons bar. This seems highly unlikely, but in the name of this column I thought I’d run an innocent Google search to check. But even as I started typing in the search term I just knew I couldn’t go through with it. It just felt…dirty.